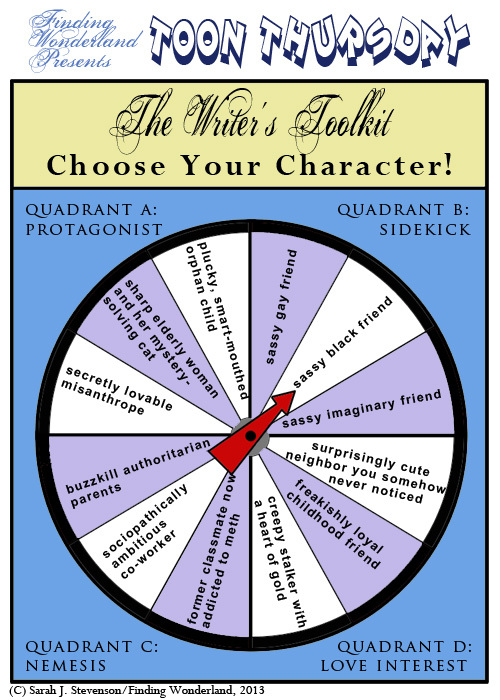 Now you no longer have to think about who's populating your stories--just spin the wheel and watch your novel write itself! You're welcome. Wait! Wait! I need a Quirky Neighbor! The neighborhood watch lady could also be the quirky neighbor?? I dunno - I think she's less quirky than originally written. Now she's just nosy. This is hilarious. You are hilarious. As always. In real life, I don't have a sidekick, a love interest, or a nemesis. a plucky, sassy, loyal girl. It's OK; I don't have a sidekick (unless you count my cat) or a nemesis, either. But yes, now I'm wishing I'd included Nosy Neighbor! Especially considering how widespread they are in real life.